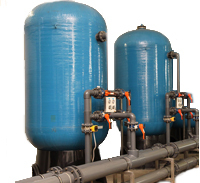 We have designed Commercial Reverse Osmosis Systems (RO) for a wide range of industries, from small companies, restaurants to large Hospitals and Lab facilities. We have systems available off the shelf that can be customized by our ISO 9001 certified factory to meet your water purification needs. 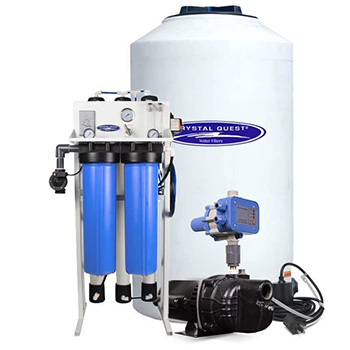 A typical RO System requires pre-filters (all systems come with sediment and carbon pre-filters, additional filtration may be needed based on your water conditions). The output is usually much slower flow. For larger applications , such as whole house and commercial use, we recommend a pressurized or atmospheric (stainless steel or plastic) storage tank. If drinking water is desired, a remineralizer tank is also recommended. For applications where slow flow is ok, such as lab water, you may use water directly from the system. Commercial / Whole House Reverse Osmosis System that produces 500 gallons per day. Commercial / Whole House Reverse Osmosis System that produces 4000 gallons per day. We offer a full line of Commercial RO Purifiers, from 200 gallons per day light , up to 7000 gpd commercial , and as high as 10,000 gallons per day and larger Industrial RO Systems. For Whole House and commercial applications such as businesses , restaurants consider that RO rating means how much water can be produced by the system in best water conditions and during 24 hour continuous operation. It is typically better to have a storage tank if larger volume or faster recovery is desired.